Risotto requires a bit of patience, something I’m usually in short supply of on a Monday night. But a last week – when I first said I’d be “restarting this blog” – I came home on a cold dark evening to find no one would be home for a while. I was hungry and felt like cooking but not like eating by myself, so for once a slow simmering dish seemed like a great idea on a weeknight. When I go to the bother of cooking a dish from scratch, I want it to be satisfying. Not just in a “my stomach is full and I am less grumpy now” way, but in an “engages all the senses” kind of way. This dish is certainly that – it’s colorful, intensely flavorful, filling, and aromatic. Even the patience it requires as you stir in the broth engages the senses along the way. I didn’t want to do something too complicated, but I was fine with a little puttering. Especially in the winter I like to try to find dishes that can use pantry ingredients and a few fresh vegetables to bring back some of the intensity of summer and fall. 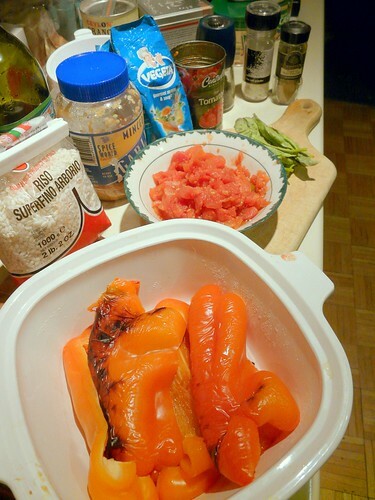 This recipe called for red peppers and basil and I had both on hand from a recent grocery trip, but also uses rice and canned tomatoes, which are more filling and full-flavored for the winter. Roasting the peppers may seem like an unnecessary complication, but it’s hardly any work when you get into it and the flavor it brings out is definitely worth the bother. Still, start on that first – wash and halve the peppers, then gather the other ingredients and keep an eye on the broiler to make sure they don’t burn up entirely. Set them aside in a sealed container or bag to steam after they’ve blistered a bit and that step is completely out of the way. 1 Wash the red peppers and cut in half. Lay face-down on a large pan, spread out evenly, then place in the broiler and cook until skins blister and blacken. Place in a dish with a tight cover to steam for 10 minutes. 2 Heat oil and garlic in a wide pan – a big skillet or a dutch oven will be best, not something like a saucepan that’s taller than it is wide. Reserve juice from tomatoes and set aside – add tomatoes and cook for 5 minutes. While tomatoes cook, remove peels from peppers and cut into thin slices. 4 Slowly stir in broth and let the rice absorb it before adding more. It may begin to stick on the bottom if you don’t stir it regularly – rotating the pan can also help keep it from sticking in one place. 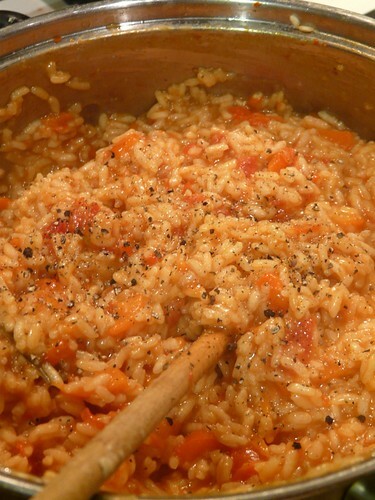 By the time you’ve added all of the broth, the rice should be fully cooked. 5 Taste for salt and pepper when rice is cooked, then remove from heat and let sit 10 minutes. Just before serving, stir in the sliced fresh basil.